Buy Handmade Wooden Rabbit Hutches in Confidence, with Garden Woodcraft. If you are looking for a new outdoor rabbit hutch, ferret hutch or guinea pig hutch, you will find the ideal solution in our online rabbit hutch shop. RSPCA hutch standards now insist that you should ideally be looking for a 5 ft rabbit hutch for a single rabbit or since rabbits hate being lonely, a 6 ft rabbit hutch might be best. These can be expensive and cumbersome, however. After a frustrating search for suitable rabbit housing, many pet owners still resort to using small, second-hand rabbit hutches as a temporary measure that often becomes permanent, or else attempt to make their own from rabbit hutch plans they found on the internet. At Gardenwoodcraft.co.uk, we offer a range of buildable rabbit hutch designs starting from the simple but high quality starter hutch with run, to the ample yet compact back to back’ double rabbit hutch and run combo, and more. We give you the flexibility of starting out with a manageable, cheap rabbit hutch with the peace of mind that you can soon upgrade to a luxury rabbit hutch village without necessarily having to sell your existing hutch. Garden Woodcraft are a long-established builder of handmade garden furniture and luxury pet homes. All of our items are handmade from quality timber and treated for durability against the elements while still ensuring a safe environment for your pets. We deliver and assemble in person, so you can rest assured that you are getting a complete service and the personal attention that is so often missing when you buy online. Many pet rabbit owners will have seen their rabbits for sale and obtained their new rabbit on impulse. This is understandable as they are very appealing animals, and with enough care and attention they make very affectionate and intelligent pets. Looking after rabbits can become tedious but with a good starting point you will be able to establish an easy routine that works well for both the new bunny and you. For more information on caring for a pet rabbit, please read our pages on rabbit hutch placement and rabbit hutch maintenance. 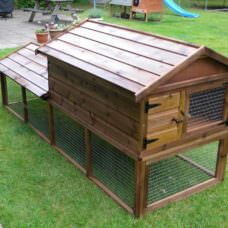 Buy your rabbit hutch online and with confidence, with Garden Woodcraft, the trusted garden furniture specialist since 1985.